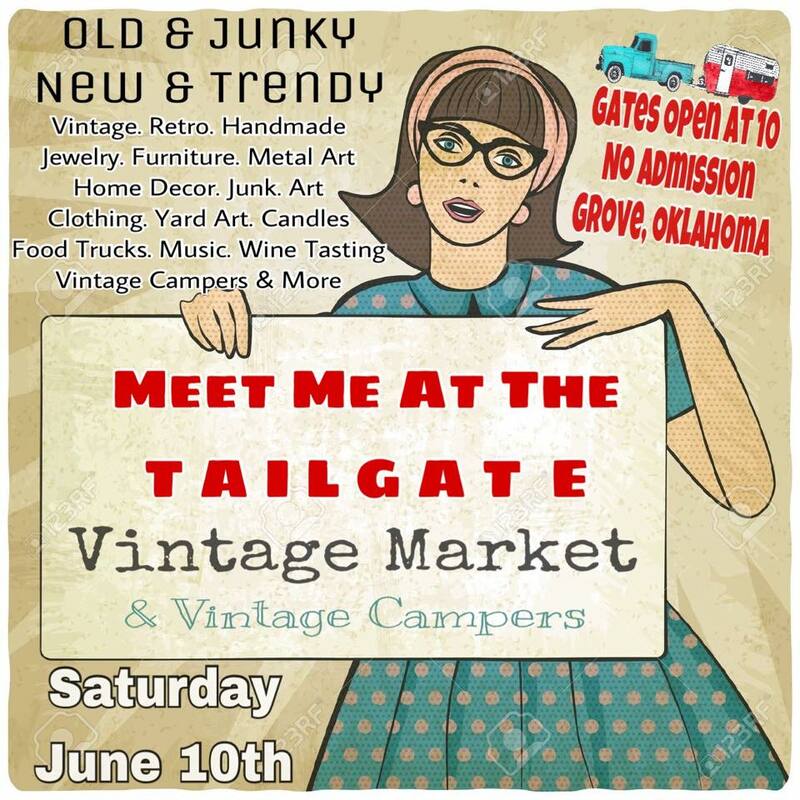 Vintage By The Creek, a pop-up market held in Grove, Oklahoma, will feature over 50 vendors at their next event, scheduled for Saturday, June 10th, 2017 from 10 am to 3 pm. The market takes place at 1621 S. Broadway St in Grove, adjacent to the Grove Civic Center and there is no admission charge. It’s completely FREE to come on in and shop around! The theme for the June 10th event is Meet Me At The Tailgate. Like flea markets, pop-up markets let shoppers browse items in a gallery like setting, but the merchandise for sale typically consists of specialty or handmade items from local artists, crafters and designers. The great things about markets like this is it gives you – the shoppers – the chance to ‘meet the makers’ and put a face and story to the objects you buy. With over 50 vendors confirmed, you can be sure to find a wide range of items, ranging from home decor to handmade jewelry to custom metal artwork to antiques and furniture and clothing and crafts and so much more. Basically, a whole bunch of really cool stuff. 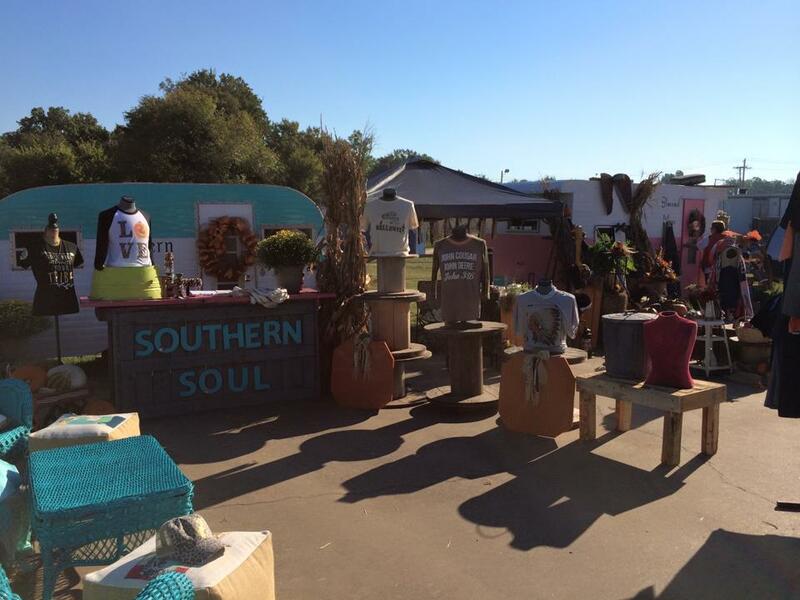 Vendors are coming to Grove from a 4-state area, with a few traveling as far as 250 miles to attend. There will also be food trucks, live music, wine tasting, professional photography and craft and painting classes scheduled throughout the day – so truly something for everyone. And don’t forget about the pony rides for the kids! Vintage By The Creek began as a loose association by some local Grove women who all loved ‘junking’ and vintage trailers. One thing led to another and when they got their vintage trailers together with their arts and crafts in their location in Grove, which happens to be by the creek, a new Grove tradition was born. Thanks to the advice and encouragement from friends, organizer Kim Hacker said she “wondered why we couldn’t take something we all enjoy and share it with the visitors to this town we love”. With Grove and Grand Lake already such a great summertime destination, it just made sense to create the type of market that people love to visit. And when those folks come to Grove and Grand Lake, they are also visiting the local attractions, eating in area restaurants, staying in area hotels and even visiting the other great shops and stores found in Grove. With over 50 vendors, event organizers are hoping to attract well over 1,000 visitors and shoppers to the market on June 10th. And get there early, because the 1st 100 people through the gate get a custom Meet Me at the Tailgate bag with great gift items and deals from Grove area merchants. Did we mention there is no admission charge? Make your plans now to visit Grove on June 10th and be part of the excitement that is the Vintage By The Creek pop-up market and go home with some great new treasures. Visit the Vintage By The Creek Facebook page HERE for all the latest details leading up to the event. NextAre You An Education Leader Ready To Make The Move To Grand Lake?